The Greater Patagonian Trail is a long distance trail that leads right through the heart of the legendary Patagonian Andes. It's a stunningly beautiful and diverse trail that crosses volcanic fields, idyllic Andean valleys, snow covered mountain ranges, lush green forests and deep blue lakes and rivers. At 1,500km it isn't short, and almost all walkers will tackle chunks of it! "In the last 3 years me and my wife have investigated and published a long distance trail in Patagonia that currently spans 1500 km of pristine Patagonian landscape and soon the trail will be extended to 2000 km. It is not an official trail that was planned and set up by a government agency. It’s better: it’s a compilation of the most beautiful and diverse trails, neglected minor roads and cross country sections through the Patagonian Andes selected by a passionate hiker. Summary: The Greater Patagonian Trail is a long distance trail that leads you right through the heart of the legendary Patagonian Andes. It's a stunningly beautiful and diverse trail that crosses volcanic fields, idyllic Andean valleys, snow covered mountain ranges, lush green forests and deep blue lakes and rivers. On this 1500 km long trail you will meet herdsmen with their animals, indigenous Pehuenche on their homeland and courageous settlers that ventured into a challenging backcountry. In several parts the trail branches into different routes giving you various choices. You may walk the entire trail or you can take a packraft with you to paddle over pristine mountain lakes and to float down on calm meandering rivers. You can also opt to climb up to the summits of several landmark volcanos on the trail. And if the regular route is not challenging enough for you than you can venture into even more remote backcountry. Walkopedia says: This looks amazing Jan, thank you so much for suggesting this. At 1,500km it isn't short, and almost all walkers will tackle chunks of it! "I'm currently working on a major update. The trail has grown from 1'500 km to now about 3'000 km and with all the options combined the entire network exceeds 12'000 km. Within the next month I plan to publish an updated trail files. I strongly recommend using a handheld GPS (Garmin) as no suitable paper maps exist. I will publish KMZ files for Google Earth and IMG files for Garmin GPS. The last season the majority of the hikers enjoyed the trail and contributed positively but some hikers where surprisingly unprepared and potentially damaging with their attitude. Therefore I plan to build in this "hurdle". What makes this trail so unique is that it is not on official trail but that your are a guest. This human interest aspect can not be undermined on this trail. You will meet arrieros (local designation for cowboys), native Pehuenche and settlers that moved into this area during the last century. Therefore having conversational Spanish skill is so essential. When you read the "Hiker's Manual" you will understand what I'm referring to. This trail was not created to thru-hike Patagonia, it's a route network for "immersion-hiking". 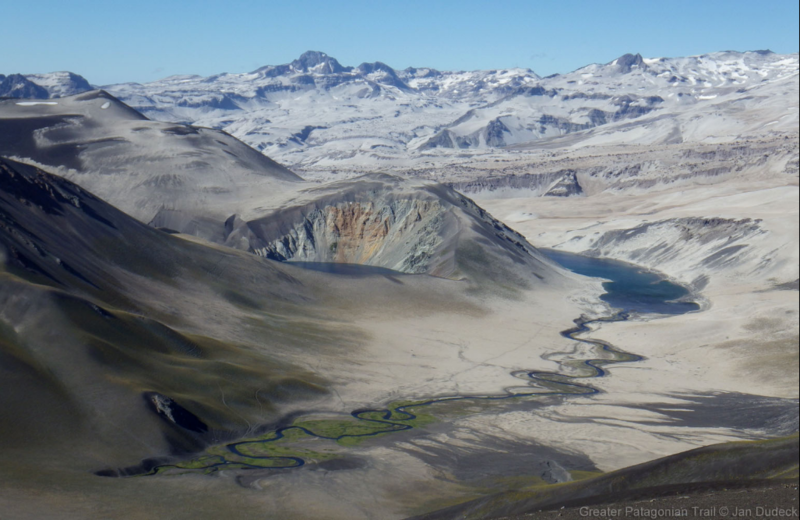 The GPT does not get you through Patagonia but gets you deep into Patagonia."